O.O.P.S.ville is a wonderful town, after all there are no mistakes just Outstanding Opportunities Presenting Suddenly. 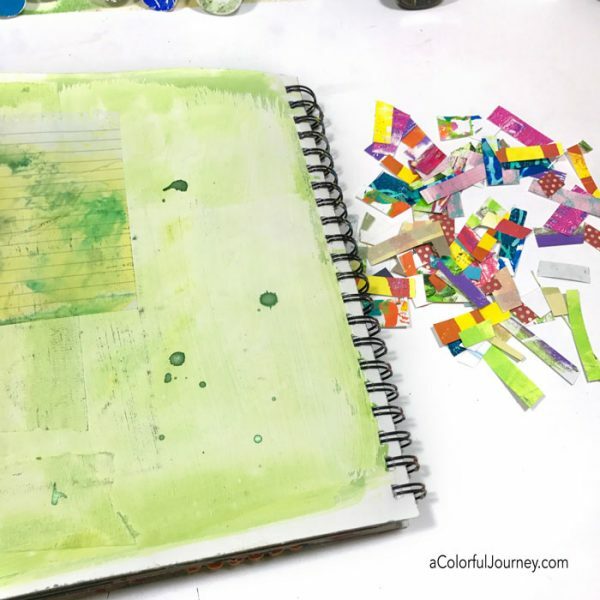 This art journal page started with the leftover scraps I just couldn’t bear to throw away from cardmaking with gel prints. Living up to the name of this town, plenty of OOPSies were a part of this process and of course I left them all in the video! 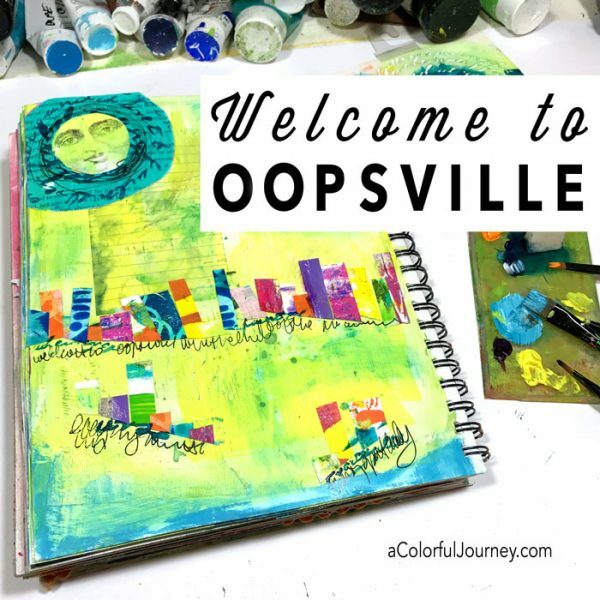 Watch OOPSville in my art journal on YouTube. 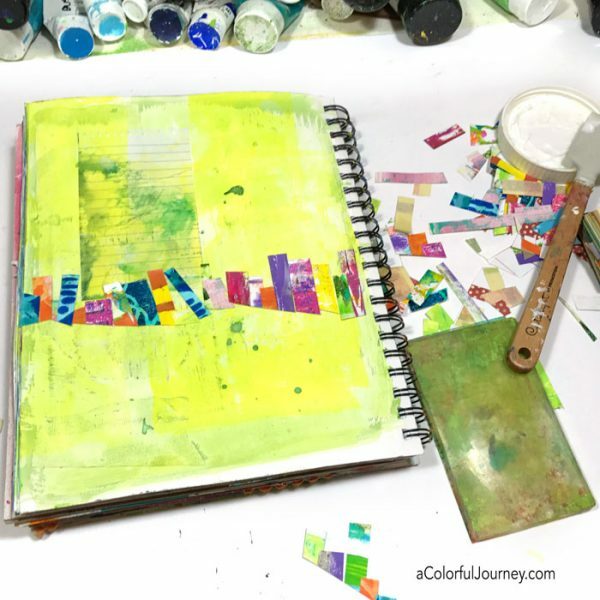 A hoarded pile of small colorful scraps from making cards with gel prints led to this page. You can see where the scraps came from here. 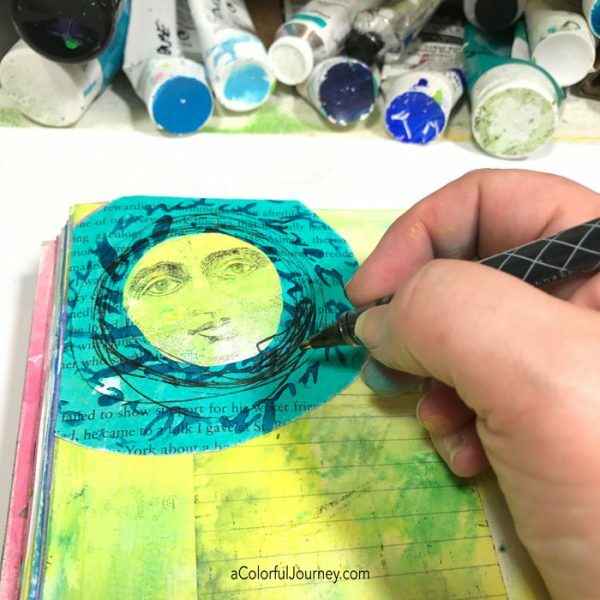 To get a layer of bright yellow paint on the art journal page, I used a 3×5 Gel Press Plate. 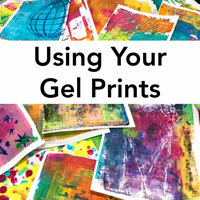 If you’re new to gel printing or just curious about monoprinting, I’ve made an introductory Getting Started Gel Printing step-by-step video for you. First OOPS…when I just tossed the pieces of paper onto the journal, I loved their shape. Immediately, I saw buildings in the colorful scraps and the town was founded. Welcome to OOPSville. When I went to glue it down it just didn’t feel as loose and free. OOPSville was living up to its name. 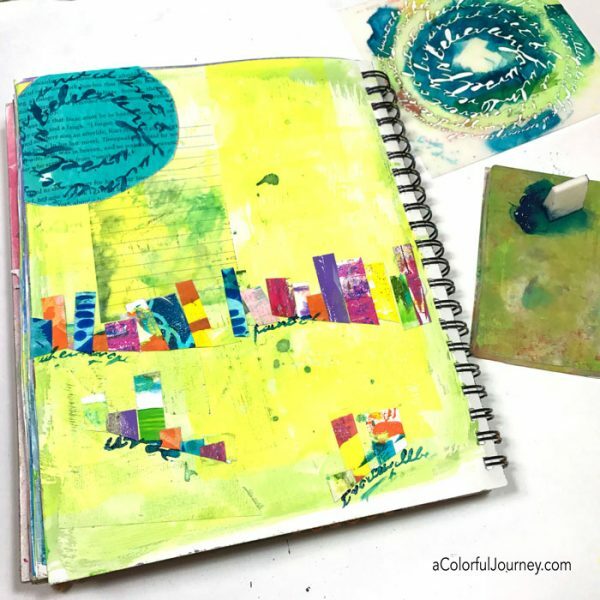 This colorful skyline needed a sun, so I used a scrap circle of painted book text. The circular words is courtesy of my Encouraging Words stencil. 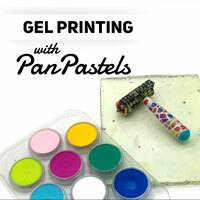 As long as I had the Gel Press Plate out next to me, it was easy to use as a paint palette. After all, paint will peel right off of it. The sun became a moon when I spied my man in the moon stamp from Stampa Rosa on the shelf. When I stamped directly on the page it barely printed and naturally, the part that did print clearly was not where I wanted it. OOPS! 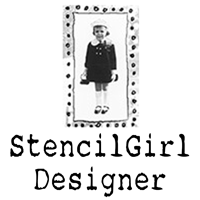 I redid the image, but the mark from the first stamping was too visible for my taste. The opportunity in that OOPS? To take a pen and draw loose circles all around the moon. I thought I wanted more color on this page. 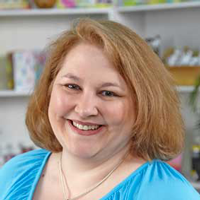 That is the first place I look when I am not sure what a page needs. 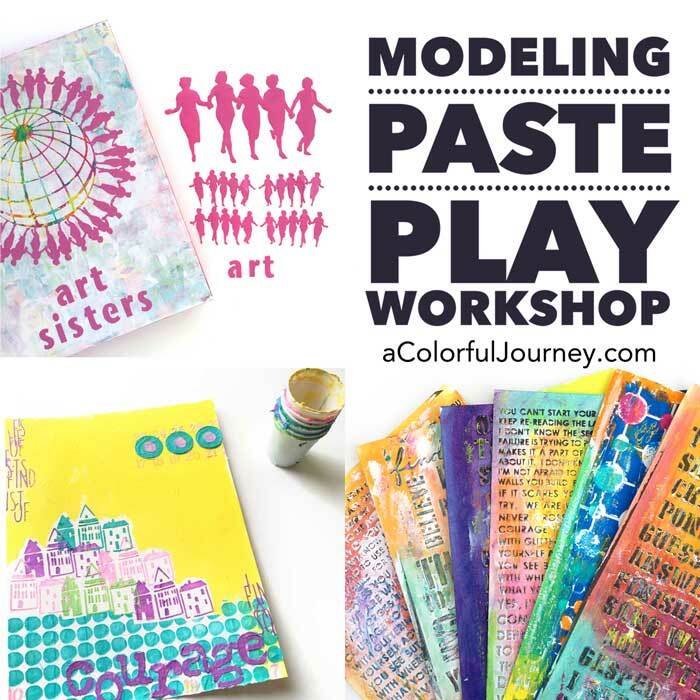 Notice the Gel Press Plate with all the colors I kept trying? I tried to use them but kept stopping myself. In the end, it was just a bit of scribble journaling and OOPSville was finished. 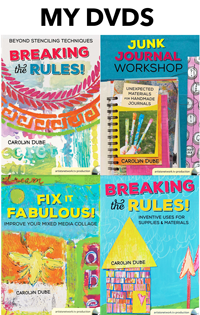 I love the use of scraps! I can never get rid of my pretty scraps. Thanks for a new way to use them. 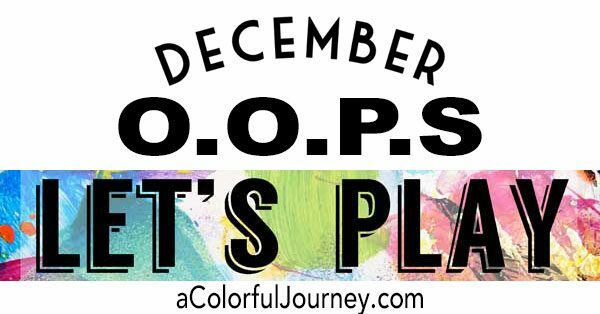 OOPS is turning art into masterpieces! How fabulous! : ) I can’t wait to see what 2017 brings. Love Oopsville! And the man in the moon! I love those little buildings and your videos are always so fun to watch and are very inspiring. My favorite quote—“Your buildings always need to match the sun” Thats a great oopsville motto. I love the writing under the building . Now I am off to oopsville to make use of my scraps! I absolutely love your sweet little town! I have tons of these kind of scraps from trimming card fronts before mounting them on cards. Now I know what to do with them! I also like to weave them together into a colorful paper weaving grid. Love your town. I am making a page and I may need a town. Thanks for this fun, educational and inspiring video. 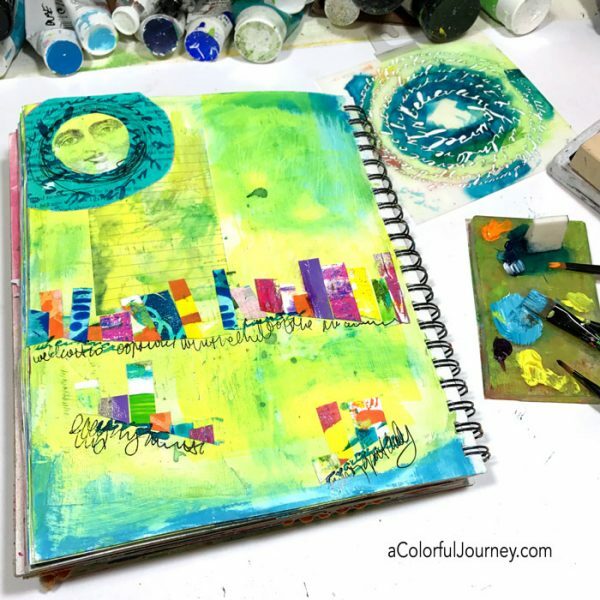 A lovely oopsville town, thank you so much for sharing your adventure and story of how you created this fun mixed media artjournal page.